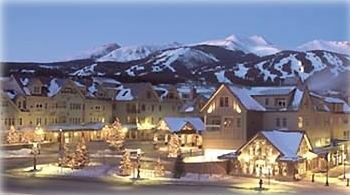 2 bedroom mountain view corner unit condo in LUXURY resort in Breck! Centrally located right on Main Street, this spacious 2BD/2BA is offered at a great rate and includes FREE heated underground parking. PERFECT LOCATION, great views, and all conveniences provide you with a hassle-free vacation for the whole family. You can WALK to everything, even the LIFT! Park your car in the underground garage, leave your ski gear at the ski valet downstairs, and WALK 3-minutes to the ski lift. Forget anything? No problem ... you can rent from Christy Sports right downstairs. In the winter, the SKI SCHOOL is also located right downstairs. After your daytime activities, enjoy the work out room, 7 hot tubs, and the Pioneer Club Lounge (located on site & shared with the Hyatt) as well as amenities such as a steam room and a large outdoor heated pool. Living room -- cable TV, stereo, comfy queen-size pull-out sofa, 2 over-sized chairs, and a cozy gas fireplace. Linens, towels, kitchen amenities, dishes, and barware are all included, plus there's a dishwasher and washer/dryer in the unit. Relax on the mountain view balcony that overlooks downtown. Or, when you choose to venture out, you can WALK to everything that the town has to offer. Shops, restaurants, and Massage therapy are located just downstairs, or take a stroll down Main Street for dozens more things to do! All the restaurants in town are a very short walk away. It's also easy to explore several other local resorts: Keystone (20 min by car), Arapahoe Basin (20 min), Vail and Beaver Creek for skiing (45 min), and only twenty minutes to Dillon for sailing or horseback riding. On the Bus and major airport shuttle routes. Please, NO Smoking and NO Pets. Enjoy your vacation! Stackable W/D unit in condo plus full-size machines down the hall. Excellent apartment for two couples. We stayed for two weeks. Easy walk to ski lifts and right on Main Street. Free ski valet in adjacent building convenient with warm boots each morning. Good kitchen facilities. Will try and book again for our next Breckenridge adventure. We've been coming to Breck for six years and love staying at the end of Main Street because we're able to walk to the lifts and to town. The highlights for this particular condo are in unit laundry (HUGE plus for me) and a good amount of space. The bedrooms and baths are all good size - nothing feels cramped. The living room/kitchen are also nice - gas fire place is always a nice bonus. I don't really have any real complaints about the place - just a few comments about things we noticed but weren't too bothered by. It's on the second floor with a garage door below that is sometimes opened and closed early or late... not a huge problem but noticeable. The view of main street is nice but this comes with extra noise such has snowplows, delivery trucks or other random vehicles. I think the biggest detraction for me (but this wouldn't prevent me from staying here again) is the ski valet. We didn't realized we'd have to use it... ski equipment isn't allowed in the condo. We took our stuff over to the valet which isn't far but is in the next building... away from the direction of the lifts. In the mornings we found the retrieval process to be very slow. By midweek we started storing our things in the back of our rental because it was easier and quicker to pop down to the garage each morning then walk over to the valet and wait for our things. If we stayed here again we'd just do this all week. All-in-all I recommend this condo for location and amenities. Great location and price. Walking distance to The Maggie Quicksilver Lift and right on the corner of Main Street and Park Ave, shopping and dining was just across the street. Free ski valet, exercise facilities, outdoor heated pool, and several outdoor hot tubs included. Great bargain! The location of this unit was perfect for our first time to Breckenridge. The ski rentals and lift tickets were accesible by walking downstairs and outside the unit. The ski lift was very easy to reach, even in ski boots. We did not take our car out of the garage the entire time of our stay. If choosing to go to other peaks at Breckenridge, it was easy to follow the map and ski to those peaks or take the Trolley which was right out side the building to the Gondola. I sure hope we can come back soon! We had a wonderful time. The condo had everything we needed. My family and I stayed a few weekends ago. This condo is right at the intersection of Park and Main St making it very close to shopping and great restaurants. Quicksilver lift and ski school are just across the courtyard area. It was very convenient for my brother and nephew each morning and afternoon. The condo itself is comfortable with everything you need in the kitchen for meals “at home”. We would definitely choose to stay here again. Water Sports on nearby Lake Dillon in the summer.